And now execute the mongorestore again. That worked for me. I am using MongoID to access MongoDB from a Ruby on Rails application. It is a good library. But there are some things I found out during the project, I want to share here. Nothing bad. Just some behaviors should now about. That is very useful. You can also make easily a case insensitive search by adding a “i” to the end of the regex. One fast workaround is to store the names twice. One times regular and one times lowercased. In that way you can execute the fast query on the lowercased column and in the UI you can show the normal name. This is a criteria object with the constraint “_id = -1”. And because there is no object in the collection with ID equal -1 it returns 0 Users. MongoDB is a document-oriented database. One cool feature is that you can easily set up a MongoDB cluster, a Replica Set. A Replica Set has at least 3 nodes. Show here on the image from the MongoDB docu. In a Replica Set there is always one Master! All other nodes are “SECONDARY” nodes! Write operations have always to go to the “PRIMARY” (Master) Node. 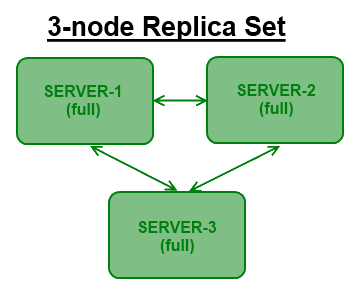 Read operations can also go to SECONDARY nodes. You can do that on 3 different servers, or more if you want. Than log in into the server which should be the first PRIMARY. Here you have to start the mongo shell and initiate the replica set. That is initiating the replica set. Now the replica set is running with 1 node. Now you have to add the other nodes. Because we started the mongod process with the parameter “–rest” we can see now a small web application showing us the status of our replica set. Here we should see 3 Members. 1 PRIMARY and 2 SECONDARY. If you connect now to a SECONDARY you will see the document there. If the PRIMARY goes down, there is an election in the replica set. So that one of the SECONDARIES become the new PRIMARY. When the old PRIMARY is again up and running, he will sync with the other nodes and become again the current PRIMARY. You can read more about Replica Set Configuration here: MongoDB Replica Set Configuration. read_secondary options has now been deprecated and will be removed in driver v2.0. Use the :read option instead. Than you just have to change your configuration. Just replace “read_secondary” with “read”.